In continuation of my piece on visual innovators in games, I couldn't help but admire the sheer beauty and originality of the up and coming NaissanceE, due to be released later this week. I asked its creator Mavros Sedeño a few questions about his stylish, nearly monochromatic first-person puzzler. In your own words: What makes NaissanceE's visual style unique? NaissanceE uses simple texture-less shapes combined in such a way that leads to rich and complex environments. This paradoxical association creates an unusual visual style helping to give this world its particular mood. 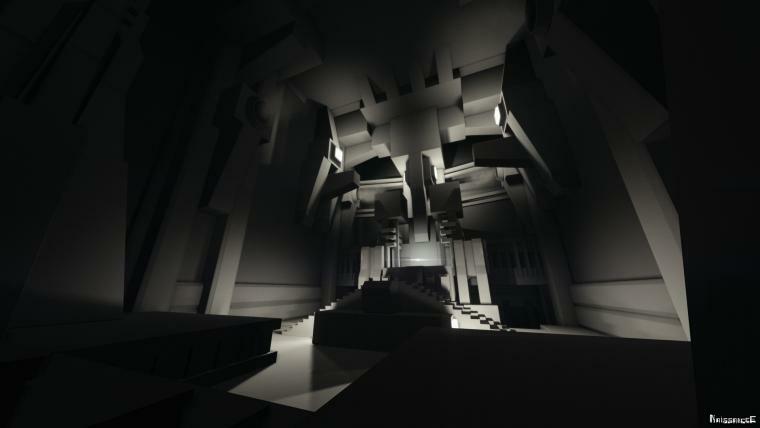 In addition, the almost colour-less ambiance re-enforces the feeling of desolation and abandonment the player experiences when exploring the endless gigantic structures of NaissanceE. You also can notice in the different videos and screenshots that there is a large range of abstraction in the environments, from pure visual to more representative constructions. These many variations, however still homogeneous on a large scale, are in correlation with the several games mechanics the player will encounter, like sections where lights and shadows are used to alter the perception of space and rhythmically structure the player progression. When walking through this world, you can sometimes recognize more or less familiar structures like buildings, stairs or bridges, but assembled in such an abnormal way that you can’t be sure what you are facing. What is the purpose of this kind of underworld cities ? Where did all the inhabitants go? Are you alone? The main reason I chose to give the game this kind of minimalist but also symbolic graphics is to encourage the player to use their imagination and to find their own answers. 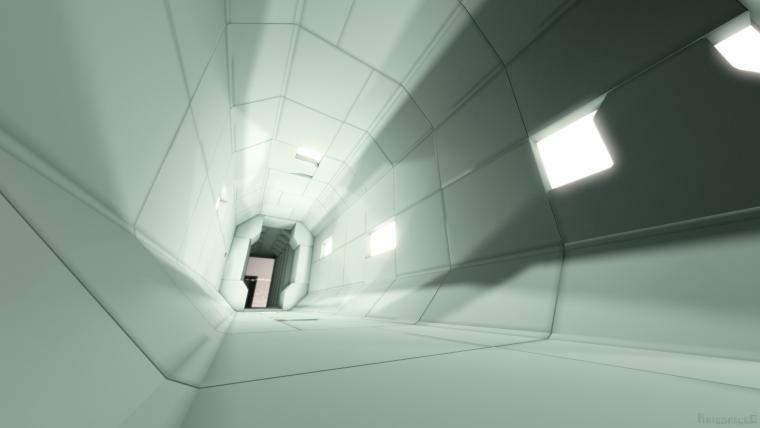 It also was a good way to express my artistic creativity by not limiting the level design to traditional constraints. NaissanceE's look is a peculiar kind of abstract realism. What do you think about the industry's constant striving for photorealism? My opinion is photorealism is simpler to understand for most people. Graphics art is language and the industry doesn’t like to take risks. So most big companies prefer to use the most simple language, the one it’s more easy to see the beauty in for most people, because it looks like the world they see everyday. But I think things are changing, thanks to the explosion of the indie scene. Some years ago we saw Okami or Madworld missing the commercial success, but today AAA games like Dishonoured or Bioshock Infinite propose something out of the norms and are successful. These examples may encourage the industry to give more freedom to game artists. 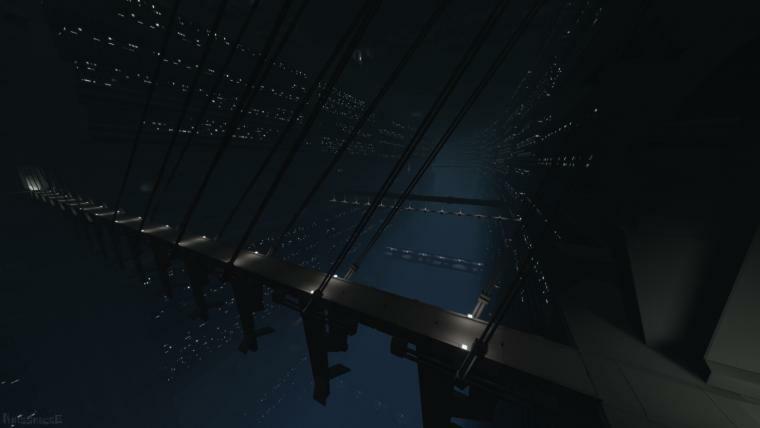 NaissanceE takes visual cues not only from other games (Portal comes to mind, but also Antichamber), but also from film (Kubricks 2001, Syd Mead) and graphic artists like Piranesi and MC Escher. Am I correct? Do you see other visual arts and artists as inspiration for your game's visual design? If so, which in particular? Correct indeed. Others big influences are Blame! by Tsutomu Nihei, Frank Lloyd Wright's architectural work, Anouk de Clerck’s "Buildings" or the House of Leaves book by Mark Z. Danielewski. This last one I discovered it during the game production by reading comments on a news about NaissanceE ! But I would say the most important influences is music. It’s my best inspiration and many sequences in NaissanceE are directly inspired, even structured by the music, in order to create a kind of synaesthesia. For that reason I want to thanks a lot Pauline Oliveros, Patricia Dallio and Thierry Zaboitzeff for allowing me to use their music in the game. Without them, NaissanceE would never be the same experience. Do you think that it's more difficult to succeed for games that try something different visually? It may be easier to get noticed among the mass of games when trying something visually different but on the other hand, it will limit the audience to those ready to enjoy this difference. So it’s hard to say if it’s more or less difficult but I think it’s clearly more rewarding for the developers and more pleasing for the player.